First the Facts. Palmer Amaranth (Amaranthus palmeri) is a plant that is closely related to pigweed and waterhemp; in fact, the seeds cannot be visually distinguished with certainty from these close cousins. With careful attention, plants can be visually distinguished from their close cousins and genetic tests can reveal the identity of a plant or seed as well. Palmer Amaranth is native to the desert southwest, and is now commonly found in the southeast US. Recently, it has gained much notoriety as it has been found moving its way north. The World is Full of Weeds, So What’s the Fuss About? There has been much talk about Palmer lately. In a native planting itself, there are always weeds, especially the first years, and Palmer Amaranth is not a large concern; being an annual, its presence should lessen as the perennial natives become established. Other weeds such as Sericea Lespedeza, Johnson Grass, Crown Vetch, and Tall Fescue should be a much bigger concern in native plantings. The concern with this plant is its propensity to become resistant to herbicides when proper rotation between herbicides with different modes of action is not followed. If a plant is resistant, it has a tremendous ability to spread because of its prolific seed production capabilities. So, the concern is about it moving to row crop fields. How is It Spread? Palmer Amaranth is spread in many ways. Waterfowl eat the seeds of this and other pigweeds, and the seeds can remain viable through the animals’ digestive tracts meaning wherever they go, they can move the seed with them; in fact, the Mizzou Weed Science department calculates that waterfowl can potentially move Palmer Amaranth 1700 miles at a time (see information)! 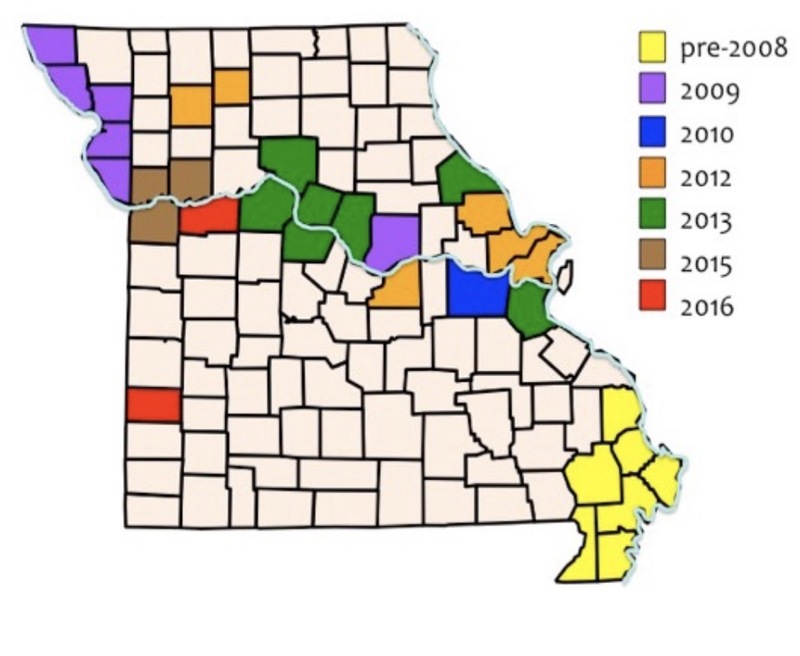 To look at a map of Palmer in Missouri (see Figure 1), it in large part follows the major waterways where waterfowl move. A second way that Palmer is spread is on equipment when moving from a field where the species is present to a field where it is not without first thoroughly cleaning the equipment. Livestock feed is often a mover of weed seed and has been shown to be a source of Palmer; it may fall directly to the ground or pass through the digestive tract of livestock unharmed. Another source of Palmer may be contaminated seed including row crop seed, cover crop seeds, vegetable seeds, and native seeds. What We’re Doing About It. We don’t wish to contribute to the problem of Palmer Amaranth spreading to crop fields. So, we have genetically tested pigweed seed from any lot of seed that shows pigweed on the seed test and have not identified any Palmer Amaranth. While Palmer Amaranth populations are relatively localized and it is a concern to the row crop famers, we do not intend to sell seed seed with Palmer Amaranth anywhere it could potentially be a problem.